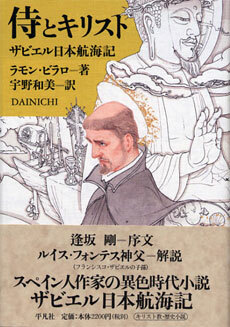 With the title Samurai and Christ, the publisher Heibonsha has published the novel Dainichi. The saga of Francis Xavier in Japan, where he recounted his experiences in Japan mid-sixteenth century. The novel was bought by the Prime Minister Naoto Kan, a fact that received widespread media coverage. This book was the basis for the television documentary Javier. The legacy of Francis Xavier in Japan, co-chaired in 2007 by the author and Gonzalo Robledo, to mark the V birth centenary of the Navarrese missionary and co-founder of the Society of Jesus. Also based on this novel is working on a film project in co-production between Spain, Japan and the United States, with the American director Nancy Savoca. The purchase of Naoto Kant he book Dainichi, Ramon Vilaró novel that tells the story of the Jesuit Francisco Javier Navarro. Dainichi's novel, from the Cambio16 collaborator, Ramón Vilaró, has recently been translated into Japanese and with great success. Former Prime Minister Naoto Kan has been one of its thousands of readers. On the occasion of the V Centenary of the birth of Francisco Javier Navarro missionary history was filmed in the documentary "The Legacy of Francisco Javier in Japan" co-produced by the EIG Group, Cambio16 editor. Try to comfort, Kan bought three books a few days ago about the drama of Fukushima and a novel about the historical connection between Spain and Japan, in its issue titled in japanese Samurai and Christ, the catalan journalist and writer Ramon Vilaró. The work, the original title of which is Dainichi. Epic Francis Xavier in Japan, tells the work of navarro priest's missionary by Japanese land in 1549.